Since 2002, this 3,000-square foot showcase has been the first place to find new products before they are offered in Pendleton's catalogs and 40 specialty shops nationwide. The flagship location remains the only store that offers the complete line of Pendleton Home under one roof, with decorating ideas for every room in the house. 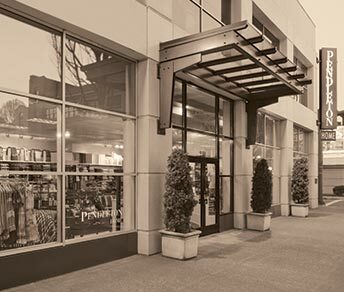 Our flagship Home Store is a lifestyle concept that includes Pendleton blankets, throws, home furnishings, gifts and accessories as well as apparel. It is located in Portland, Oregon, in the same grand old building as our corporate offices. Browsing through this Pendleton wonderland, complete with room settings, is a great way to envision how Pendleton products fit beautifully into a myriad of individual styles. The largest collection of our fabulous Native American blankets is viewable here, too. We'd love to show you around the next time you visit the Pacific Northwest.